THEY where OVER COMERS and they Had No JESUS. How can anyone today NOT OVERCOME since we have an INTERCESSOR who has already OVERCOME, and we OVERCOME through him, as he speaks to us by his Spirit. The Book of JOB is the oldest book of the Bible, so our History starts with JOB. Job is the REAL FATHER of FAITH since Job is the one who gets in God's Face and begins his complaint about there being NO INTERCESSOR, or NO daysman betwixt God and Man. Job complains to GOD and tells God what he should do. Job 9:32 For [he is] not a man, as I [am, that] I should answer him, [and] we should come together in judgment. Job 9:33 Neither is there any daysman betwixt us, [that] might lay his hand upon us both. Job 9:35 Then] would I speak, and not fear him; but [it is] not so with me. Job 19:7 Behold, I cry out of wrong, but I am not heard: I cry aloud, but [there is] no judgment. JOB OPENS the DOOR by PRAYER unto God for a Go between that will Reason with God, for Man. ABRAHAM was the MAN who was able to receive, by FAITH the PROMISE of God that would answer Jobs Prayer. Yes, JESUS was the Out Come of God answering JOBS prayer, or complaint. Yes this woman Stood up for her own NATION and went against all Royal Protocol to Defend her people. 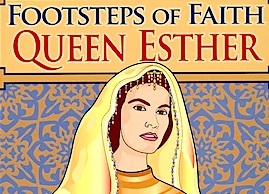 She was a GREAT WOMAN of FAITH who used Godly Strategy to help her expose the lies of the devil. She SAVED a WHOLE NATION with her cunning and beauty. God Honored her FAITH. Daniel and his friends STOOD UP by NOT WAVERING from their FAITH in the Face of Certain Death. Remember they where living in Exile, not their own homeland, and they had a very cushy life living in the Palace. But they Refused to Obey the King and their FAITH was Put to the Ultimate Test and God Honored them, and stood with them in the Fiery Furnace. Mary had FAITH to give Birth to the SON of GOD. She was a Teenager. So this Story should be Told Loudly to the Teens of Today what God can do in your Life if you are Looking to Serve and Honor him. She likened herself as the Lord's bondslave. Do you know any Teenagers Serving the Lord like that today? LUKE 1:38 And Mary said, “Behold, the bondslave of the Lord; be it done to me according to your word.” And the angel departed from her. Then there was Mary Magdalene who would not leave JESUS even after he was DEAD. She was still Pursuing him, and looking to take care of him herself after his Death. Her FAITH brought JESUS to her Personally, in a State that no one else has ever seen but her. Here in this MOMENT JESUS is giving a WORD to a WOMAN, to give to the Men, there by settling Once and for all Time Women’s Place in the NEW KINGDOM. JESUS Liberated WOMEN forever in this MOMENT.!!! 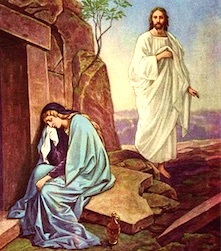 John 20:17 Jesus says to her, "Do not touch Me, for not yet have I ascended to the Father. Now go to My brothers and say to them, 'I am ascending to My Father and your Father, and to My God and your God.'" Men still do not get it. This is what GREAT FAITH can Produce. Visitations from Outside of Time that Bring GOD on the SCENE to Minister to you Personally. Most of the other examples are Weak compared to these.